The Loy Krathong Festival in Thailand which falls on the full moon of the twelfth lunar month (usually during the first half of November) is one of the most interesting and picturesque festivals of this nation. The tradition of Loy Krathong is believed to have started in Sukhothai, northern Bangkok around 800 years ago. The Thai word, ‘Loy’ means ‘to float’ while ‘krathong’ means a lotus-shaped vessel, usually made from banana leaves. The festival is celebrated after the main rice harvest season where the Thai people pay homage to the Water Goddess, Mae Khongkha, for the year’s bountiful supply and also to ask for forgiveness for polluting the waters. The romantic side of this festival is provided by a legend about the origins of the festival in 13th century Sukhothai. Legend has it that Nang Nopamas, a royal consort of King Ramkhamhaeng (the founder of Sukhothai), made the first krathong as an offering to Mae Khongkha. She intended for it to sail past her lover, the king when she floated it on one of the waterways of the palace. This thrilled the king very much and from then on came the saying that if two lovers float a krathong and it stays afloat until they can see it no longer, their love will be long lasting. On the evening of the Loy Krathong celebration, people from all walks of life can be seen gathering at waterways of sorts and releasing their krathongs (decorated with flowers, candles and incense) on to the waters to be floated away. Today, the krathongs are also floated on lakes and ponds as well. The thousands of flickering candles being floated on the water surface are indeed a mesmerizing sight to behold! While Loy Krathong is celebrated throughout Thailand, the grandest celebration is in Chiang Mai where large procession floats designed and fashioned as krathongs go on pubic parade. They come in various themes with celebrants dressed in regal Thai costumes or mystical beings. You may also be fortunate enough to catch a glimpse of the beauty queens on board the krathongs procession floats waving to the crowd. 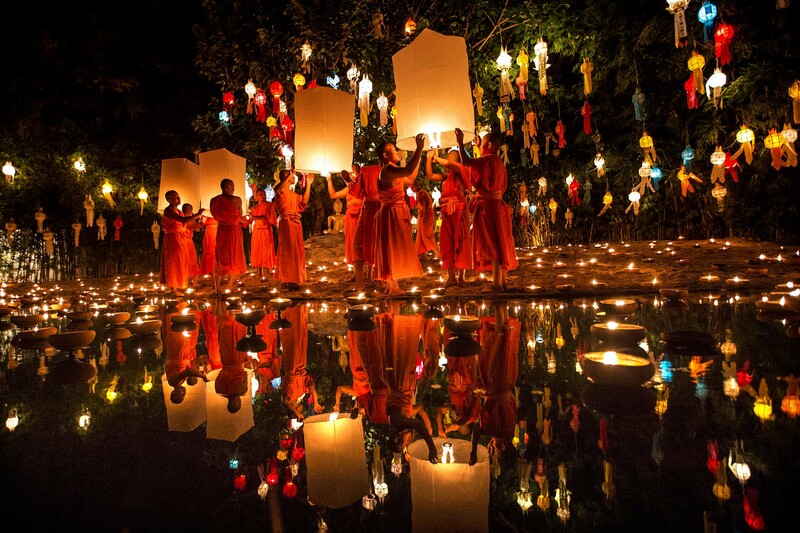 Another added feature of the Loy Krathong celebration in Chiang Mai is the parallel festival called Yi Peng. This is a celebrated by launching hot air lanterns made from rice paper into the night sky. The hundreds or thousands of these lanterns launched into the air at once make for a spectacular and awesome sight. As with the krathong, all the family members would hold on to the floating lantern together before releasing it into the sky.